For my first Bowie Song of the week I’ve chosen an old favourite of mine Drive-in Saturday – from Aladdin Sane (1973). The beautiful lyrics conjure up many weird images of a sad futuristic world but the contradictory 50s sound with its ‘Dom do ah’ roots it in the past – perhaps a couple in a lonely dome watching black and white movie trying to recreate a happier time. The magic of all his songs is the ability for the listener to fit their own moods and ideas into the abstact lyrics…and I love the saxophone part. Favourite Line – Don’t forget to turn on the light, Don’t laugh Babe, it’ll be alright. 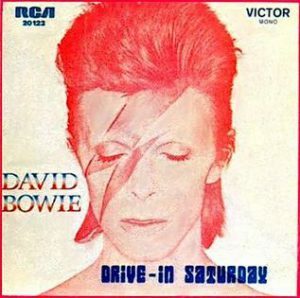 This is the cover art for the single Drive-In Saturday by the artist David Bowie. The cover art copyright is believed to belong to the label, RCA Records /, or the graphic artist(s).